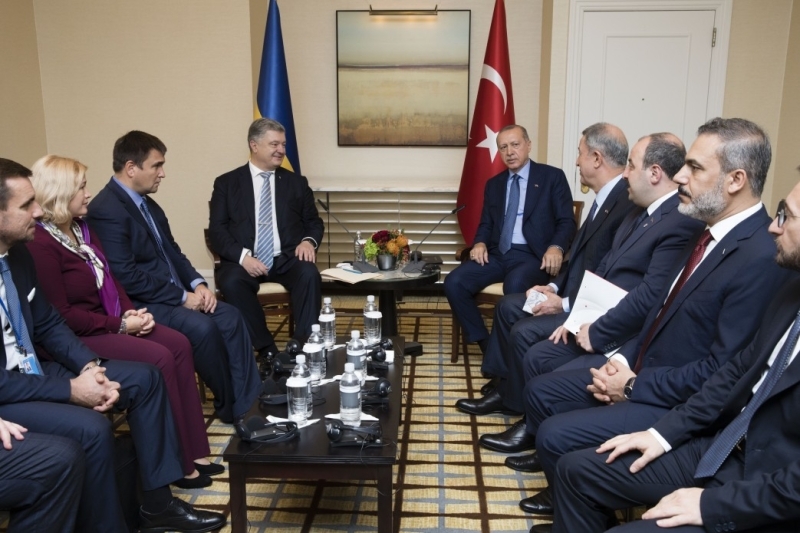 Last month, on November 3–4, Ukrainian President Petro Poroshenko visited Turkey to meet with his Turkish counterpart, Recep Tayyip Erdoğan (President.gov.ua, November 3). This was the two leaders’ fifth official meeting. As has been common to their talks in the past, they discussed issues falling into three main “baskets”: the military, economics, and Turkish arbitration in Ukraine’s relations with Russia—in particular, concerning the situation of the Crimean Tatars in occupied Crimea. As part of the visit, Poroshenko and Erdoğan held the seventh meeting of the High-Level Strategic Council, a bilateral format first established in 2011 (President.gov.ua, November 3). After talking with Erdoğan, President Poroshenko stressed, “Important for us are Turkey’s assurances that it will not stand aside amidst Russia’s aggression in the Sea of Azov” Fakty.ua, November 3). That statement was crucially noteworthy in retrospect, considering the November 25 Russian attack on three Ukrainian naval vessels trying to reach Ukraine’s Azov Sea ports of Mariupol and Berdyansk (see EDM, November 26, 28, 29). Earlier this year (June 12), Poroshenko also attended the opening ceremony of the Trans-Anatolian Natural Gas Pipeline (TANAP), in Turkey. At this event, the Ukrainian president declared that his country would be open to receiving gas from this pipeline (Korrespondent.net, June 13). Yet, for the Kremlin, the most irritating aspect of Turkey and Ukraine’s evolving relations is arguably their growing military cooperation. These two states already jointly participate in the North Atlantic Treaty Organization’s (NATO) military drills in the Black Sea. At the same time, Turkey controls the Turkish Straits, which, according to the Montreux Convention, it could close off, thus limiting Russia’s access to the Eastern Mediterranean in a time of war. From Ukraine’s perspective, the Montreux Convention is a double-edged sword, since it also limits passage through the Straits for non–Black Sea NATO members’ ships. Moreover, Turkey continues to oppose the creation of a permanent Alliance naval mission in the Black Sea. Last September, Ukrainian parliamentary deputy Anna Hopko called on Turkey to block Russia’s passage through the Straits considering Moscow’s aggression in the Black and Azov seas (5.ua, September 10). In light of Russia’s November 25 aggression against Ukraine at sea, that idea has recently gained additional momentum in Kyiv (UNIAN, November 30). – Turkey and Ukraine jointly participate within the NATO framework and hold regular high-level bilateral meetings. – In April 2016, Ukraine’s state-owned defense-industry enterprise Ukroboronprom began cooperating with Turkish company Havelsan on operating passive radar production facilities (Ukroboronprom.com.ua, April 11, 2016). – In May 2017, Ukrainian state-owned plane-maker Antonov signed a memorandum of cooperation with Turkish Aerospace Industries (TAI) for the development and production of various modifications of combat unmanned aerial vehicles (UAV). The memorandum was also signed by the head of the National Security and Defense Council of Ukraine, Oleksandr Turchynov (Ukroboronprom.com.ua, May 10, 2017). – In November 2016, following a year of negotiations, Ukraine signed an agreement with the Turkish firm ASELSAN for the procurement of military radio systems together with the software necessary to make them compatible with the Ukrainian military’s preexisting Harris and Motorola models (Aselsan.com.tr, October 10, 2017). – In April 2018, Turkey and Ukraine presented a jointly built transport plane, the An-188, constructed according to NATO standards (TSN.ua, April 26, 2018). – Turkey is considering turning to Ukraine to purchase engines for the Altay main battle tank. Last year, the prime ministers of both states signed a memorandum of understanding regarding the possibility of building Ukrainian 6ТD3 engines for Turkish tanks (Mil.in.ua, March 29, 2017). – In May 2018, Ukrainian state-owned company Luch, together with Turkey’s ASELSAN, tested the Skif anti-tank guided missile (Defence-ua.com, September 8). – According to Interior Minister Arsen Avakov, Ukraine won a tender for the modernization of Turkey’s M-17 helicopters (Twitter.com/AvakovArsen, September 4). – Ukraine is open to Turkish participation in a potential United Nations peacekeeping operation in Donbas (Facebook.com/petroporoshenko, April 9). It is possible to draw a number of strategic conclusions based on this growing list of cooperative initiatives. First, their military-technical cooperation may help to speed up the transformation of the Ukrainian Armed Forces and assist in bringing them closer to NATO standards. And on the other hand, Turkey is drawing on Ukraine’s own intellectual and technical resources, including tank engine or aircraft design and construction. Indeed, it is easier for Kyiv to cooperate with a partner that has its own practical reasons to want to work with Ukraine than it is for Kyiv to collaborate with many (more technologically advanced) Western partners. Finally, Turkey and Ukraine’s close cooperation is driven by a national security interest to counterbalance Russia in the Black Sea region. Russia’s latest provocative actions regarding the Sea of Azov are thus likely to further spur Turkey and Ukraine’s developing military strategic partnership. It of course remains to be seen how far either side will push this cooperation. But its further development in the military, political and economic spheres could contribute to preventing further Russian expansion and effectively deter it. Thus, it is in the West’s collective interest to see this strategic military partnership between Kyiv and Ankara expand and flourish.